Mabel's Labels has a Limited Edition Camp Combo pack of their sturdy, colorful, waterproof labels for sale until the end of June. It has all the labels you need to identify your kids' clothes, toiletries, backpacks, bags, goggles, cleats, shinguards, hats and more (it would take me all summer to list all the ways you can use these labels!). The Camp Combo is a far better value than their Basic Kit: for $5 more, you get all the labels included in the Basic Kit, plus 10 extra Sticky Labels, 8 extra Tag Mates labels, and the 2 free friendship bracelets. If you order in February (that's today! ), you get a $2 discount, so you pay $37.95 instead of $39.95 -- but the combo pack itself is only available till June, so make sure you order yours before then. What are you doing this summer? My sister is coming to visit from the Philippines with her 3 kids, and I've already got a host of plans for my kids and hers. Top on the list will be watching Disney's animated film Brave. Robin Hood-style archery, men in kilts, funny accents, a fiery, headstrong heroine -- what's not to like? Pens are like hangers and socks, always disappearing when least expect them to, and turning up in the most unlikely places. But unlike hangers and socks, there's a more sinister side to pen loss. You know what I mean. Ever had a favorite pen? Have your kids or husband ever "borrowed" this pen and "forgot" to return it? Do you guard it with your life? Yeah, I thought so. The technology.... a unique blend of ultra-low viscosity inks and optimized writing tips to give you unparalleled smoothness. The art... a range of sleek and modern pen designs housing a rich palette of vivid ink colors to dazzle your writing imagination. 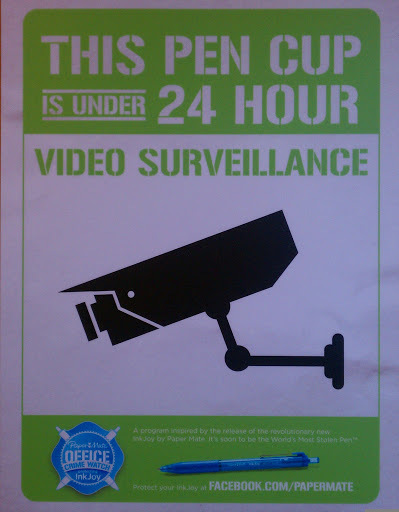 Let potential pen thieves know that you won't be tolerating any pen-stealing nonsense. Papermate gave me this awesome warning poster; feel free to download and print so you can tell friends, coworkers and family that You. Are. Watching. Stash your Papermate InkJoy pens in a place no one would ever look for them. For potential hiding places, think of every place you've ever left your car keys: the refrigerator, the cereal cabinet, and your winter ski jacket are all good. 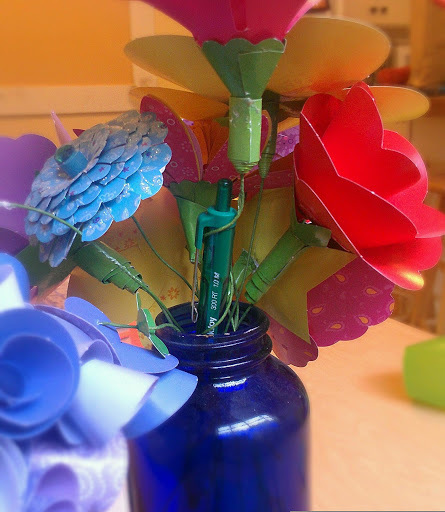 Hide your Papermate InkJoy pen in plain sight -- think flowers, chopsticks, Barbie doll stilts, and with a bit of luck no one will even realize what it is (This works best in a family with a history of nearsightedness). Offer potential pen-thieves an inferior pen. They will go away happily, marveling at your generosity, not realizing you've saved the best for yourself. An inferior pen is easy to find, since all pens are inferior to the InkJoy. For maximum security, enlist the services of a professional who is experienced in foiling robberies, stealth attacks, and secret plots. Make sure he or she is an expert pen-guard, as opposed to body-guard. I happen to have my own personal attack ninja but you can choose to employ ex-CIA, MIA or KGB agents as well. My InkJoy pens are safe... for now. 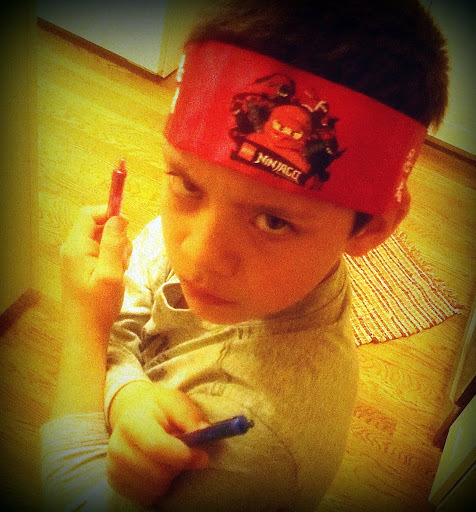 Constant vigilance is key, but remember, these InkJoy pens are worth protecting. Good luck! Watch Disney on Ice presents Disney-Pixar's Toy Story 3! Last night I took the kids to the opening performance of Disney On Ice presents Disney-Pixar's Toy Story 3 at San Jose's HP Pavilion. As a Feld Family Ambassador, I've been lucky enough to have had the pleasure of viewing most of the Disney on Ice performances for the past two or three years, so while the kids and I were excited (we are big Disney on Ice fans!) we weren't expecting this performance to be all too different from the past ones. Most of the other shows feature snippets from a variety of Disney movies (Peter Pan, the Lion King, all the Disney Princess stories, etc..), but this show was entirely dedicated to Toy Story 3, so it was like watching a Broadway play, but on ice. It doesn't follow Toy Story 3 to the letter (the first act has some flashbacks to Toy Story 1 and 2), but it has all the important plot developments. In fact, if you've never seen Toy Story 3, like me, you'll still be able to follow the story. Star wars cantina song : Where Buzz reminisces about the time he got stuck in the vending machine at the Pizza Planet in Toy Story 1 -- this is one of my favorite numbers, with all the little green aliens skating around! The Toy Story characters are some of the most beloved in American culture. Boys and girls, old and young, everyone loves them! The Disney on Ice production team did a great job in bringing them to life on the ice. All the toys kept their toy-like, cartoon-like appearance, even Buzz, Woody, Jessie, Barbie and Ken: Buzz's eyebrows were penned in, just like a real toy, Jessie and Barbie had yarn wigs, and Woody and Ken had on headpieces that gave their hair that characteristic plastic look! The last time I enjoyed a Disney on Ice performance this much was their Nemo production, which we saw at the Cow Palace about 6 or 7 years ago, long before I started blogging. The kids were too young to remember much of it, so they are clear in stating that this Toy Story 3 one is the best one ever. I think it comes down to whether you like Nemo or Buzz and Woody more! In any case, it really was an enjoyable performance, and I can't recommend it highly enough. Look for the Bay Area shows of Toy Story 6 at http://www.ticketmaster.com/promo/m721pg and be sure to enter one of these redemption codes when purchasing your tickets! It's time to stock up! Tea Collection's Semi-Annual Sale is still going strong, with bargains of up to 50% for their chic and stylish clothing for girls, boys and women. This cute shirt is only ten bucks! This adorable summer dress is only $13.50! Can it get any better? Well, actually, it can -- because for 3 days only, you can get an extra 30% off with the code EXTRA30YAY. Which means the shirt and dress above will cost just..... well, I won't calculate it for you because I want to buy those, and I don't want anyone depleting the stock before I get a chance! Don't you just love photos of crying kids? The one above is one of my favorites, but I'm sure 3Po doesn't feel the same way. He's probably crying because his big sister pinched him or something, but with all that eczema on his cheeks, he had a lot to cry about during his first year! 3Po has suffered from eczema since he was 6 months old, and he hasn't outgrown it yet. 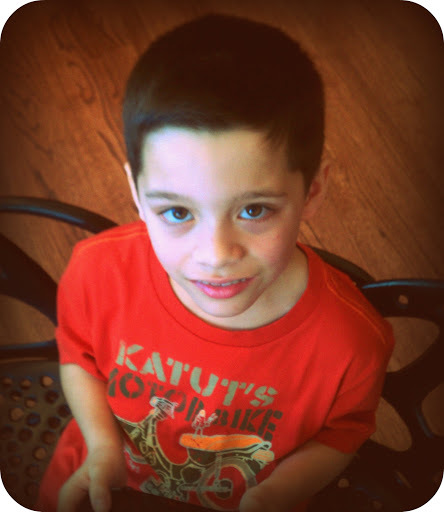 Even now, at 8 years old, he continues to have outbreaks on his arms and legs, especially during the dry winter months. We keep it under control with regular moisturizing, and 3Po has gotten "used" to it -- but you can never get "used" to the incessant itchiness. We remind him to try not to scratch, because he could break the skin and get an infection, but it's difficult to stop him -- and it breaks my heart to see him so uncomfortable. Neosporin knows there are many, many families with eczema problems, so they have come out with a line of products that help bring skin relief to kids (and a bit of mental relief to their worried parents!) Neosporin Eczema Essentials (available in your drugstore's first-aid aisle, or online at Walmart.com) is a 3-part system which includes a daily cream, daily body wash and anti-itch cream. It sounds great because it combats dryness and irritation (which, as any eczema parent knows, is eczema's BFF) not only with a cream, but with a body wash. It's also great to have that itch relief when you need it! 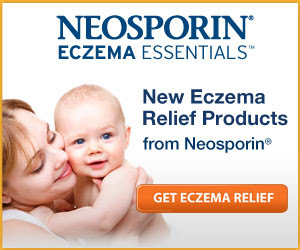 I'm definitely going to check out Neosporin Eczema Essentials line. Visit http://see.walmart.com/neosporin to get a coupon for $5.00 off Neosporin Eczema Essentials at Walmart.com. Disclosure: This is a compensated post. 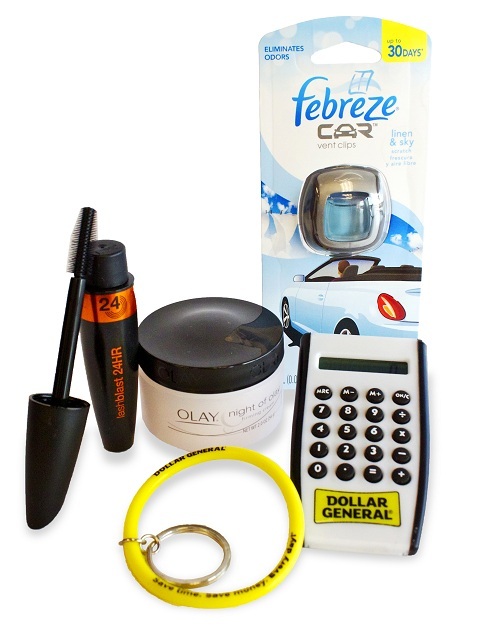 Product information is provided by Resourceful Mommy Media and is indicated in italics. The views and opinions expressed here are my own. Since February is Black History Month, the kids have been learning a lot about the leaders of the civil rights movement in the 60's, along with other prominent African-American role models. All month we've been regaled with tidbits about the lives and accomplishments of Martin Luther King, Jr, George Washington Carver and all his inventions, not to mention Colin Powell and Barack Obama. But I think the person who made the biggest impression on him is Rosa Parks. He just couldn't believe that one ordinary person could make such a huge difference. "But she was just an ordinary woman, mama! Not a scientist or a lawyer or a president". I told him that is exactly what makes Rosa Parks so great -- she showed everyone what a difference she could make and humbled everyone with her courage. That's the idea behind Dollar General's Every Day Heroes program -- that you don't need to win a Nobel Prize to be considered a hero; there are heroes who demonstrate courage and conviction and passion all around us. They launched this program during Black History month to honor and celebrate the heroes among us who make a difference -- from firefighters and veterans to teachers and caregivers. Their first Every Day Hero, Sterling Wilder, started the Jubilee Family Development Center in Lynchburg, Va, to provide local kids and families with a center for after-school tutoring, cultural activities, access to health screening and other youth and family-development services -- a haven away from drugs and violence. What a great idea! I can't wait to read about more Every Day Heroes! Win a trip for you and your family to the Essence Music Festival! In celebration of Black History Month, Coca-Cola® is offering Dollar General customers a chance to win a family trip for up to 10 people to the 2012 Essence Music Festival® presented by Coca-Cola. The Essence Music Festival – which takes place July 6 through 8 – is the country’s largest annual African-American music and empowerment event. You can enter until February 26 at Dollar General. * Dollar General key chain. Leave a comment on this post and tell me your favorite nail polish color. This entry must be completed before any extra entries will count. This giveaway ends at 11:59PM PST on February 29, 2012; I will draw a winner at random on March 1 and post his/her name after she/he confirms acceptance. Continental US residents only. For additional giveaway rules, click here. Good luck! If you're a sucker for cinnamon buns like I am, head straight to Whole Foods and grab a loaf of their new Cinnamon Bread, made especially for them by Rubicon Bakery. Whole Foods sent me a sample to try, and it is so delicious, I can hardly stop myself from going back and buying more! Disclosure: I received a sample loaf of Rubicon Cinnamon Bread from Whole Foods to facilitate my review; any future loaves (and there will be many) will be my own purchase. The views and opinions expressed here are my own. When it comes to animated films, Disney sets the standard -- at least in the Western world. As far as Japanese animation is concerned, Studio Ghibli is legendary. They're the company behind Princess Mononoke, Ponyo, and Spirited Away, which have been global commercial and critical successes (Spirited Away is the only film made outside the English-speaking world to have won an Oscar for Best Animated Feature). So when you hear that Disney has teamed up with Studio Ghibli to release a movie -- The Secret World of Arrietty -- based on a Carnegie medal-winning children's book (The Borrowers), you kind of get the sense that it's going to be good. As you can imagine, Borrowers don't want humans (or Beans, as they call them) knowing they exist. But Arrietty, being a headstrong teenager, manages to make friends with a human boy, Sean -- and inadvertently jeopardizes her family's existence. The kids really enjoyed this movie! Kids everywhere have been fascinated by the notion of tiny people living in a big world -- think of Thumbelina, Gulliver and the Lilliputs, Tinkerbell and her fairy friends (kids, after all, are little people living in a big grown-up world). They loved the thought of the Borrowers outwitting humans and to survive, using their inventiveness to transform ordinary human objects into useful tools (in the Borrowers' world, pins become swords, spools of thread are used as rope, and old postage stamps become works of art to put up on the walls). It's well suited to small kids because there is no real villain, just a frustrated housekeeper, and it's easy to talk to your kids afterwards about how people can be nasty out of ignorance or thoughtlessness rather than true malice. As a parent, I have to admit that I found the storyline a bit frustrating, especially when Arrietty's curiosity gets her whole family into trouble (Hey, Arietty, why don't you just DO AS YOU'RE TOLD??). But that's what growing up is, I guess: being allowed to make some mistakes, and learn from them, and that's another reason why the storyline resonated so much with the kids. As long as you leave your fuddy-duddy grownup hat off and go with the flow, you'll enjoy the movie too -- and you won't need to switch any hats to enjoy the beautiful animation. In this world of CGI, it's nice to see the art of animation still flourishing! The scenes of the Borrowers' world are so beautiful, with so much attention to detail, I found myself wanting to rewind again and again, so I could take in the clever details like wallpaper (made from wrapping paper and old letters), Pod's tools (made from paper clips, nails, screws), the fireplace, and more. The Secret World of Arrietty is showing in theatres now; don't miss it! Disclosure: I received an invitation to an advanced press screening of the movie. Movie synopsis was provided by Walt Disney Studios publicity and is indicated in italics. The views and opinions expressed here are my own. Awww... how cute is this Bitty Baby dress? It's the perfect Easter outfit! 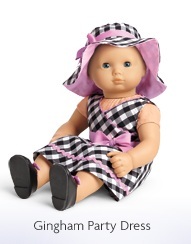 American Girl is unveiling some new Bitty Baby outfits on Thursday, Feb. 16, and they just released this preview on their Facebook page. I love the bold, black plaid! Here's a great way to celebrate Valentine's Day with your kids -- watching Lady and the Tramp, Disney's story of two mismatched canines who fall in love, is a family favorite and a love story classic. 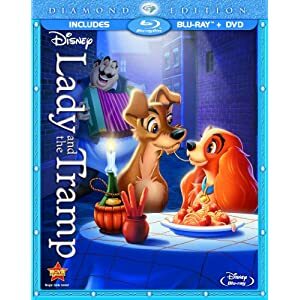 Lady and the Tramp Diamond Edition is now available on Blu-Ray, and the film is not so much "restored" as it is "transformed". The colors and detail are amazing! And like all re-releases, Disney has packed this one with loads of fun extras, like 3 deleted scenes, a documentary and a never-before released song. I still know the words of that song, and it's so heartwarming to think that my kids do, too. Hopefully their kids will know it someday -- that's how timeless Lady and the Tramp is. This movie has given us some of the most unforgettable love scenes (only Disney could make a plate of spaghetti in an alleyway romantic! ), and this Diamond Edition does a great job of showcasing them. It's definitely one for your home collection! Hurrah, Disney On Ice presents Disney-Pixar's Toy Story 3 is arriving in the Bay Area next week! They'll be at the HP Pavilion from the 22nd till the 26th, then they're moving east to Oakland's ORACLE Arena from Feb 29 till March 4, so more families can join in the fun. Talenti Gelato contest -- win 52 pints of Talenti! Ever since I reviewed Talenti gelato's decadently smooth, creamy gelatos and sorbets last fall, I have been hooked. It's getting to the point where I almost cannot shop at Whole Foods anymore, because I invariably wander over to the frozen food section to pick out a pint of Talenti's Double Dark Chocolate, Sea Salt Caramel, or my absolute favorite, the Tahitian Vanilla Bean. I've had to run many miles to justify my indulgence, but believe me it is worth it. There's only one thing better than a pint of Talenti gelato, and that's 52 pints of Talenti gelato. Oh, wait, how about 52 FREE pints of Talenti gelato? That's what's up for grabs in Talenti's new Talent Search video contest. Just submit a video showcasing your talents with Talenti gelato containers before March 19 for a chance to win. For inspiration, you can check out the Talenti-produced video, “Talenti Gelato Makes Music”, or get creative on your own. Enter on Facebook -- and if you win, don't forget I was the one who told you about the contest, and I'll accept your thanks in the form of Talenti gelato. Disclosure: I will be receiving coupons for a free pint of Talenti gelato as a thank-you for posting this information. The views and opinions expressed here are my own. The Pea loves painting her nails, and hardly a week goes by that she doesn't have a riot color on them. She paints her nails like she dresses -- with very bright colors and a lot of designs. The Pea loves putting little accents on her nails like silver tips or neon dots, but her works of art last about 2 hours. Once she starts drumming her nails on the table or using them to force open a snap-on lid or pry some Legos apart, the nails start chipping. 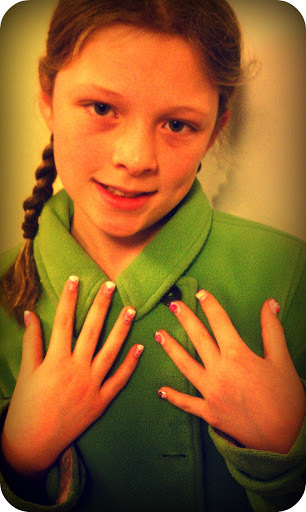 It's all in a day's work for a 10-year old, so it doesn't bother me -- until she starts clamoring for a fancy nail job at a salon! Fortunately there are so many cute press-on nails at our local drugstore. Check out these fun new nail charms sets from Popgrrl, which feature "3-D" designs that pop right out of the nail! Move over Crackle and Metallic nail polish, Popgrrl Nails Charms have just POPPED and are here to stay! Popgrrl, a new line of fashion accessories from The Wish Factory are here to take care of girls’ nail dilemmas. The perfect gift for any little sweet heart, Popgrrl Nail Charms, the first product line in the Popgrrl collection and featuring stick-on nails with 3D nail art effects – the unique designs pop right off the nail! Girls will find no need to worry about their nail polish chipping or having enough time to let their nails dry, they can easily stick on Popgrrl Nail Charms and they’re ready to get their party on! You can see more by watching this video! Popgrrl Nails Charms come in a variety of basic designs, including the Sweet Tooth collection, Animal Instincts collection and Bow So Cute collection. The line also features licensed candy brands which are the cutest gift for the sweetest girl including fruit scented Blow Pop, chocolate scented Tootsie Roll and Gummy Bears. The new Popgrrl brand is the perfect combination of fashion and fun for tween girls everywhere. The PG Nail Charms original and candy licensed product line will be sold exclusively at Toys"R"Us stores and online at Toysrus.com beginning in February 2012. 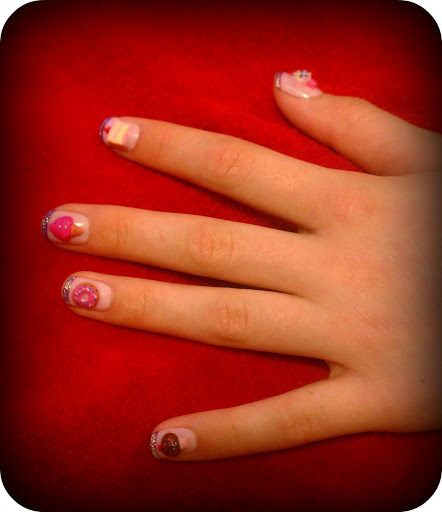 Popgrrl Nail Charms are for girls ages 6+ and cost $6-7. The Sweet Tooth collection contains 10 press-on nails. Five of them look like the nails have been painted pink, sprinkled with multicolored candy sprinkles and topped off with a dollop of whipped cream. They look so cute! There is no way I could have gotten the detail so nicely done had I tried painting The Pea's nails by myself, and it would probably have cost a fortune to get them done in a salon. The other five nails have teeny-tiny sweet treats like cupcakes, a donut and an ice cream cone, all in "3-D", on a pink background. Again, really adorable -- however, I think putting them all on the same hand actually detracts from each one because there's too much going on. 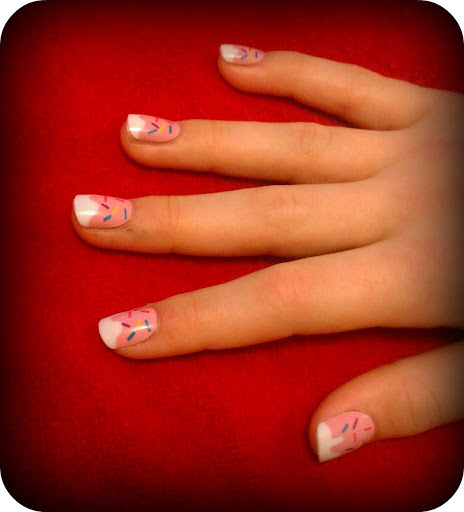 In retrospect, I would place only one of the 3-D nails on each hand, and use the sprinkles design on the other 8 fingers -- but since there are only 5 of the sprinkles design, you could also just paint the other 8 fingers pink. The nails fit The Pea really well, and they stayed put throughout the afternoon. Disclosure: I received a product sample to facilitate my review, but have not been paid to review the product or give my opinions. Product information is provided by PopGrrrl and is indicated in italics. The views and opinions expressed here are my own. My kids' Tiny Prints Valentine's Day card came in the mail a couple of days ago, and I wanted to brag to show everyone how adorable they are! I have to admit, I had my doubts. I thought they'd be way too "kiddy" for my sophisticated 2nd and 5th graders. I didn't even think they'd find a design they liked. But I was wrong. Each child found a design they absolutely loved, and they were all so excited to order it. That shows you how much I know about kid-friendly designs. 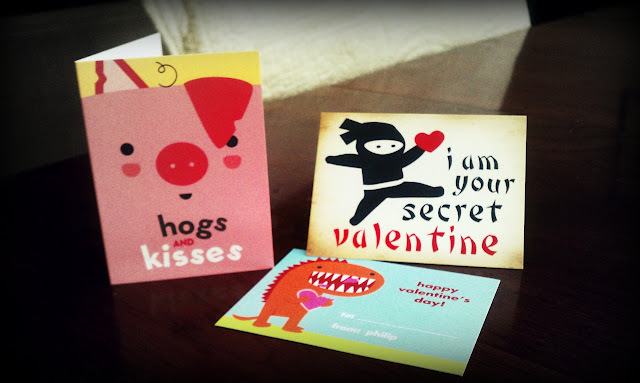 Disclosure: I received free kids' Valentines from Tiny Prints as a thank-you for a previous post. Tiny Prints neither solicited nor required this post. The views and opinions expressed here are my own. In the past, I have been known to gift my loved ones with cutesy stuffed toys for Valentine's Day, but the recipients have always been minors, i.e. my kids. I'm not the biggest fan of plush Valentine's Day presents for adults, but I'll make an exception for this adorable plush beaver from Cuddle Toys. Why? Because this isn't just any beaver, it's Justin Beaver! I can't vouch for the quality of the music that comes out of the actual Justin Beaver; it sounds pretty good on the video above, but I'll reserve judgement until Justin arrives on my front porch. I think I'm going to like him better than his human counterpart! The sweetest gift to rock Valentine’s Day and win your sweetheart’s affection is the newest star of the Cuddle Barn collection, the (Justin) Beaver plush! Featuring Justin Bieber’s officially licensed hit song, “Baby,” this cuddly, 12-inch plush is simply irresistible! Decked out in a red hoodie and a baseball cap tilted to the side, (Justin) Beaver will steal hearts everywhere with one squeeze of his foot. (Justin) Beaver is available at http://store.cuddle-barn.com/ and specialty stores nationwide at an average retail price of $29.99. How would you like to win your very own Justin Beaver? Can you say SQUEEEE?! Visit Cuddle Barn's online store, then leave a comment on this post with a link to the Cuddle Barn product you would most like to give or receive as a present. This entry must be completed before any extra entries will count. This giveaway ends at 11:59PM PST on February 20, 2012; I will draw a winner at random on February 21 and post his/her name after she/he confirms acceptance. Continental US residents only. For additional giveaway rules, click here. Good luck! Disclosure: I will be receiving my own Justin Beaver plush toy as a thank-you for posting this information and running the giveaway. Thanks to Cuddle Barn and Freeman PR for providing the sample and the giveaway prize. Product information is provided by Freeman PR and is indicated in italics. The views and opinions expressed here are my own. Gaming fans don't have long to wait before the latest and greatest in portable videogame devices -- Sony's PlayStation Vita -- is available for sale on February 22nd. Already, retailers like GameStop and BestBuy are setting up demo kiosks at select locations so people can try before they buy. This weekend, we got a chance to see the new PS Vita for ourselves when PlayStation invited me, the kids, their friends, and other bloggers and guests for an afternoon at the Vita Hill Social Club. The Vita Hill Social Club is located in San Francisco's Union Street area. From the outside, it looks like an unassuming little storefront, but when you step inside, you find yourself in a lavishly decorated lounge. The place is set up to look like the classic gentlemen's club of days gone by, with leather and velvet sofas, chandeliers, gilt-framed wall portraits and gaming tables -- except the games played here are anything but fuddy-duddy. 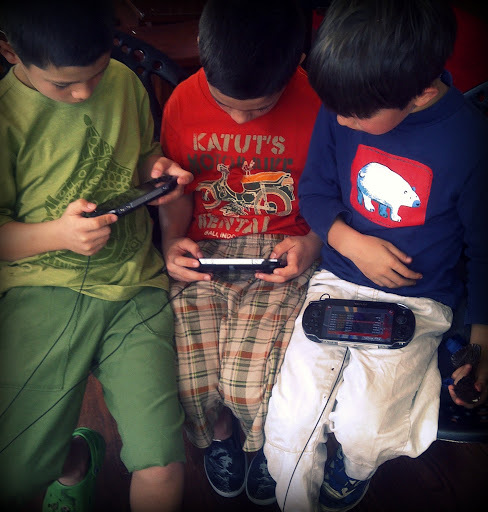 Beside a vintage magazine rack were several flat-screen monitors and PlayStation units designed to showcase the PS Vita's ability to interact with the PS3. Another wall had 3D monitors so people could immerse themselves totally in their videogame world. PlayStation and the Vita Hill staff got all the bloggers and their guests set up with individual PS Vita consoles that we could hang on to for the duration of the event. 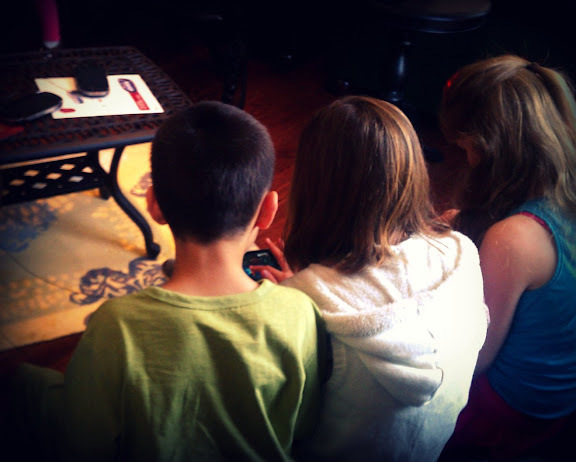 I set aside the kids' normal "screen time" limits and let them play Little Deviants, WipEout, ModNation Racers for as long as they wanted. They were in heaven! We own a PSP (PlayStation Portable), which is great, but it doesn't compare to the Vita. 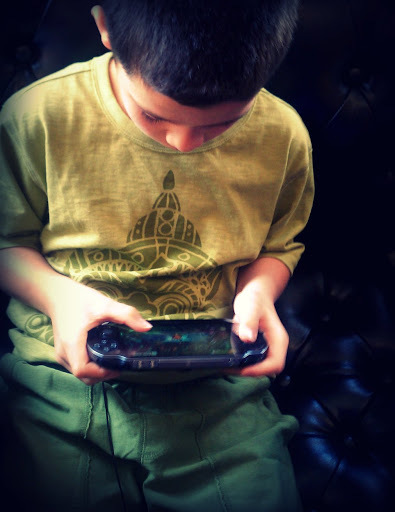 The Vita has a touchscreen, which I love because those X and O and triangle symbols on the controls have always confused me, so I can actually figure out how to play a game without help from my kids. The Vita has a touchscreen on the back and a videocamera, which sounds pretty ordinary, until you realize that some games like Little Deviant actually utilize the videocamera to make it seem like you are playing the game and blasting aliens in your own living room, i.e. (augmented reality). I won't even get to the social gaming capabilities of the PS Vita at this point, but suffice it to say that the PS Vita takes gaming to the next level. To put it another way: my kids actually ignored these adorable, scrumptious Sibby's cupcakes in favor of playing another round of ModRacers. I had to lie and say they were running out of cupcakes in order to get them to look up. There was even a fun instant photo booth, where you could pose for a photo and have it printed out onto a postcard-sized Post-It Note. One wall of the lounge was covered in Post-It Notes like these, forming a cute gamers gallery. You could also send your photo to yourself via email, or share it on Facebook and Twitter. It's hard to resist the opportunity to pose at an instant photo booth, particularly one that you don't have to put $5 in first. 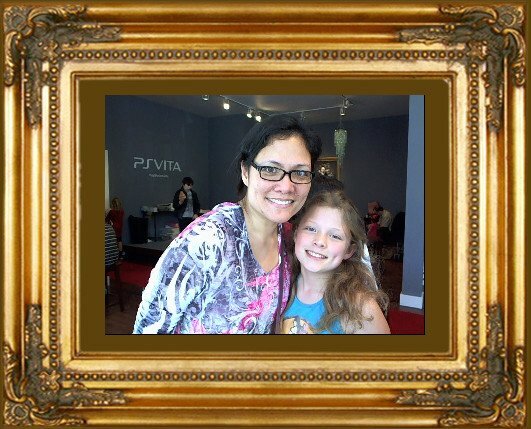 Thanks to PlayStation, we had a great afternoon at the Vita Hill Social Club. The best part? Everybody gets to join the party! That's right, I'm not blogging about the event simply to gloat to all my readers about the cool party I was invited to. 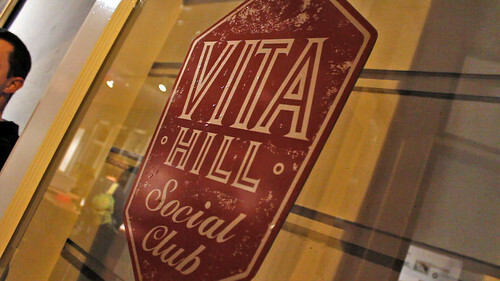 The Vita Hill Social Club is actually open to the public, so anyone can walk in off the street, sign up for a club membership on the spot, and start playing -- all for free. Seriously. They'll lend you a PS Vita pre-loaded with game titles, and you can try it out without any sales pitches or membership fees. They have lots of units available, so you won't have to be nice and share or take turns. You can join tournaments and match your skills against other gamers. I can't promise you Sibby's cupcakes, but they do have free snacks, sponsored by Guayaki Yerba Mate, KIND Healthy Snacks, and Vita Coco Coconut Water. You get to play with the photo booth thingy and send out your photo via email, Twitter or Facebook. 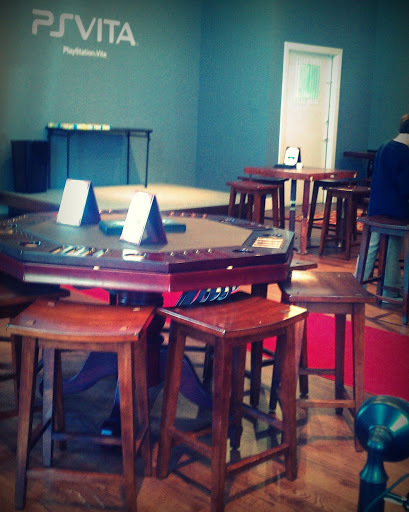 You can even organize your own private event at the Club! How swanky is that?! 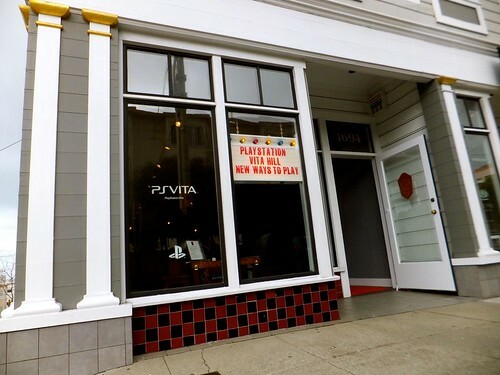 You don't even have to be in San Francisco to do it, because PlayStation has set up Vita Hill Social Clubs in LA, Miami, Atlanta, NYC, Boston, Chicago and Austin! 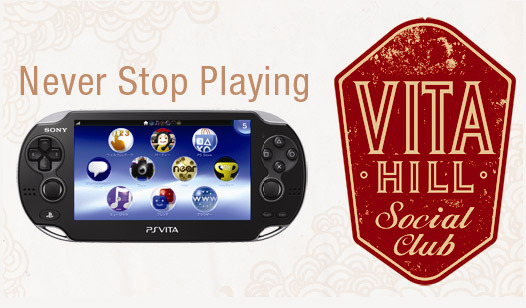 Check out the PS Vita Social Club page on Playstation.com for specific addresses and a list of local events -- but don't forget to stop by and get your game on before February is over, because the Vita Hill Social Club will be closing its doors at the end of the month. 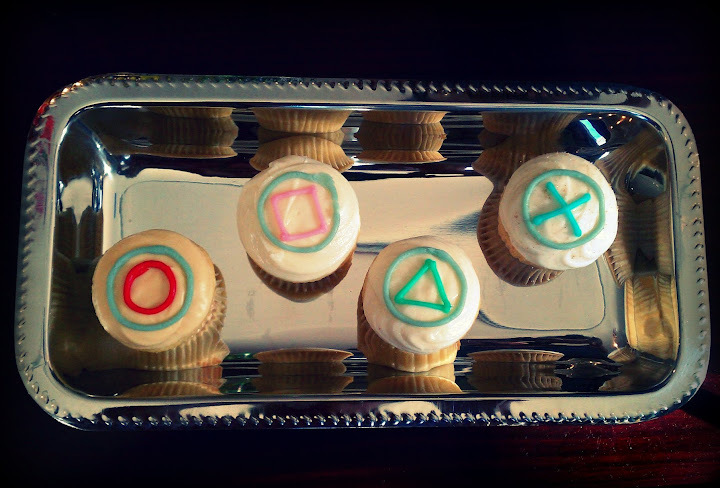 Disclosure: I received an invitation to a PS Vita Hill Social Club event as a member of the PlayStation Family. I did not receive a sample or monetary compensation for this post. The views and opinions expressed here are my own. Ahh, the classic dozen red roses. Don't waste time chasing after them in every local florist in your town, just order them online at ProFlowers! Are live blooms more your (or her) style? This Azalea bonsai is a great way to show your sweetie that your love will last long after Feb. 14. My tastes (pun intended) in V-Day presents tend to run towards the edible sort. I'm drooling over these gourmet dipped Valentine's berries from Shari's Berries. We first discovered Shari's Berries about a decade ago, when a box of Shari's Berries was mistakenly delivered to our home. We didn't really know how to return them, and we couldn't really let them go to waste, could we? Since then we've enjoyed many a delectable Shari's Berry, thanks to that initial fortuitous error. You can also get some great deals on the ProFlowers Facebook page! One lucky Bonggamom Finds reader will win a $50 gift card that can be used at either ProFlowers or Shari's Berries! Leave a comment on this post with a link to the gift item on ProFlowers or Shari's Berries that you would most like to receive for Valentine's Day, your birthday or any occasion! This entry must be completed before any extra entries will count. This giveaway ends at 11:59PM PST on February 17, 2012; I will draw a winner at random on February 18 and post his/her name after she/he confirms acceptance. Continental US residents only. For additional giveaway rules, click here. Good luck! Disclosure: I received a gift card to ProFlowers as a thank-you for administering this giveaway. Thanks to ProFlowers for providing the giveaway prize. The views and opinions expressed here are my own. Our samples from Tea Collection's new Bali line have arrived, and I couldn't be more excited! Their boys' clothing is fun-loving and cool enough to appeal to 3Po and Jammy, but it's sophisticated enough for a grownup's sense of style. Even Alfie wishes they made everything in adult sizes! The latest collection is inspired by the jungles and temples of Bali, so everything is colorful and bold -- but it also has a vintage vibe that tones down the cartoon-y feel. 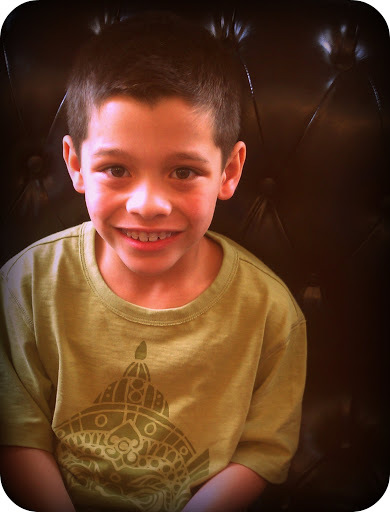 Their Monkey King tee was inspired by the Ramayana Monkey Chant dance. 3Po loves it because it's apple green (green is his favorite color), and I love it because of the monkey mask graphic. 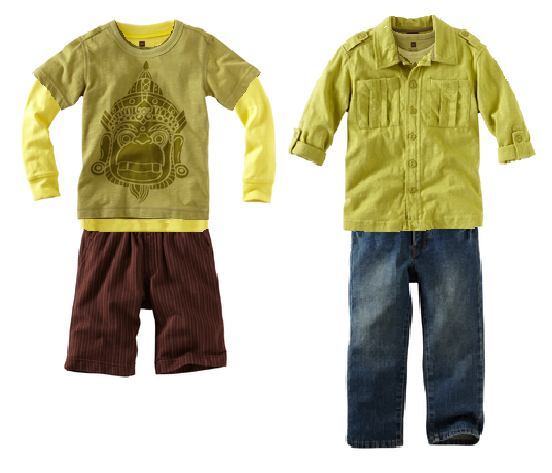 Here are some ways to wear the Monkey King tee: layered over a lemon yellow shirt, or underneath a button-down shirt. The brown ticking stripe shorts are also part of the Bali collection, as is the Roll-Up Safari Shirt. It didn't take Jammy long to figure out which one was his favorite item in the collection. 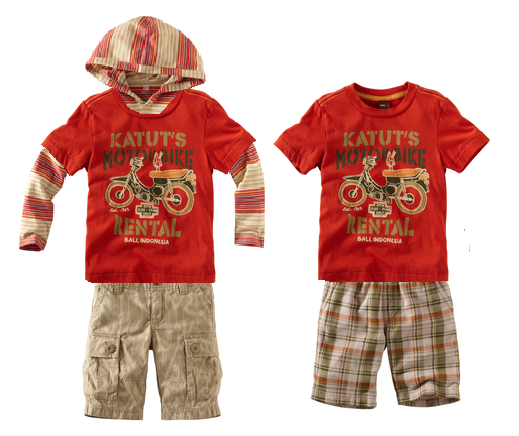 The vehicle on Katut's Motorbike Tee reminds us of the little 50cc and 100cc motorcycles that putt-putt around the streets in the provinces of the Philippines. We paired this tee with the Kecak French Terry shorts, also from the Bali collection. You might think the plaid fabric looks stiff and itchy, but these shorts are true to their name: they are made with soft, stretchy French terry (not terrycloth like in towels!) that feels so comfy. 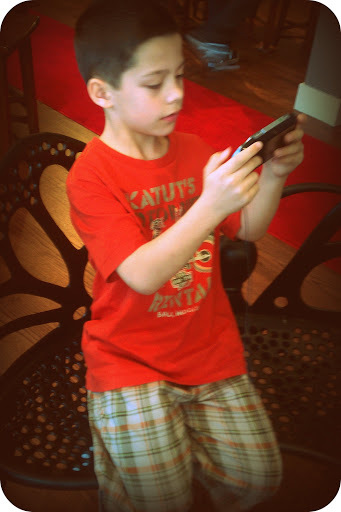 If it gets cold out, ask your son to slip a Desa Stripe Hoodie underneath his tee. The outfit goes really well with the Ikat Ripstop shorts, which might look plain and boring, but if you click on the link and look closely, you'll see the fabric actually has a subtle Indonesian Ikat print. One of the things I love best about this collection is how Tea has managed to infuse each piece of clothing with a bit of Balinese culture, whether it's the material, the print, the graphic or the name. You can read all about the rich cultures and environments all around the world that serve as Tea's inspiration for their clothing on their blog -- just head to the Behind the Design section and prepare to take a trip around the world! You've got 6 days to enter Tea's Get Set for Spring giveaway! One lucky winner will receive a $250 gift certificate and a Bali inspired wardrobe set. For more details and to enter, head on over to Tea's Facebook page. Tea, (www.teacollection.com), based in San Francisco, designs distinctive apparel collections inspired by the beauty they discover in their travels around the world -- engaging, modern and consummately wearable women’s and children’s clothing. Tea offers a full collection of clothing for children aged 0-12 that is made to love, and made to last. Tea’s line of children’s clothing is available online, in catalogs, and at specialty and department stores, including Nordstrom, Bloomingdales, Saks Fifth Avenue, and more than 300 high-end boutiques in the U.S., Europe, and Japan. Their all-new women’s line is available exclusively through Tea catalogs and the website. Please visit www.teacollection.com to view Tea’s latest globally-inspired collection. Disclosure: I received product samples from Tea to facilitate my review, but have not been paid to review the product or give my opinions. The views and opinions expressed here are my own.